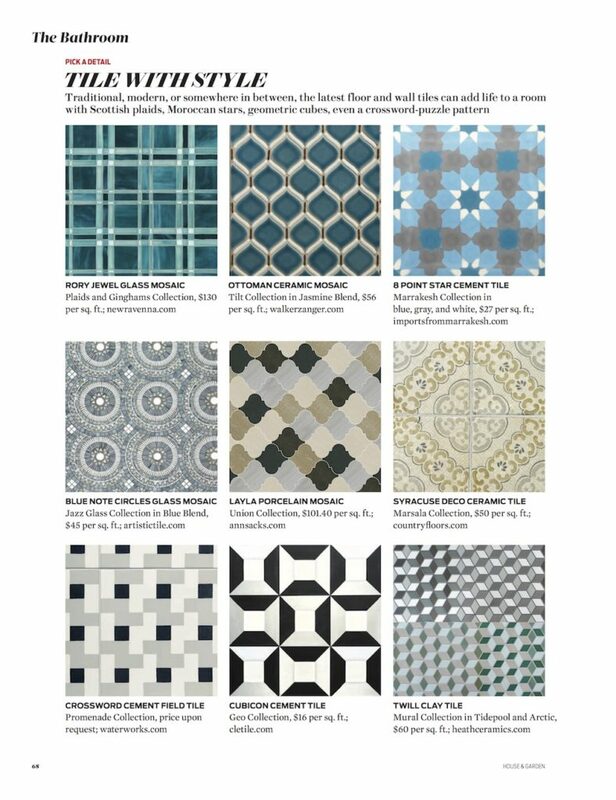 Tiles by New Ravenna and clé, both clients of Bella Figura Communications, were featured by editors of House & Garden’s special edition highlighting a selection of “128 Most Beautiful Rooms.” Clé’s Cubicon Cement tiles in the Geo Collection and New Ravenna’s Rory Jewel Glass Mosaic in the Plaids and Ginghams Collection were tapped for the “Tile with Style” page. The Plaid and Gingham mosaics designed by Sara Baldwin are available in jewel glass and natural stone in five classic designs – Rory, Hamish, Bonnie, Conner,and McIntyre. The mosaics are all hand cut and assembled on the Eastern Shore of Virginia where New Ravenna Mosaics employs over 100 artisans to create their handcrafted tile designs. Baldwin grew up on a nearby farm and loved gingham and plaid fabric as a child. Her mother taught her to sew and it was these designs reminiscent of her Scottish McCaleb family ancestors that the aspiring designer used for her experiments in fashion. Baldwin remembers, ” The first McCalebs arrived from Scotland in the 1750’s. As a child I was immersed in family lore and creating clothes with traditional Scottish patterns fueled my imagination. These textiles were considered fashionably preppy and so luckily my passion for plaid was considered popular. To create the same classic patterns in glass and stone is a wonderful way to pay homage to my family and those fantastic early creative experiments in design.” Coverage for the Plaid and Gingham Collection, gained by Bella Figura Communications, was lively when it was released. Clé calls its Cubicon tiles “a pattern of vexing allure with it’s classic box pattern that is beautifully designed for 3D affect. Similar to our Cubicon pattern, Cubicon Slant with its distinctive “perspective” offers your project classic cement tile patterning with a bold dimensional boost.” Peering into these patterns does present an eerie feeling that the depth extends much farther afield than it does!